Sea Coast Rentals, a local company specializing in vacation and long-term rentals throughout Southeastern North Carolina, has launched Rental Relief Network, an initiative to connect those who have been displaced by Hurricane Florence with property owners who don’t typically rent their homes but may now be willing to do so. Sea Coast Rentals is seeking any property owner with any size home in any location in our Onslow, Pender, New Hanover and Brunswick counties. A long-term property management agreement is not required for homeowners to participate and the firm will donate a percentage of its fees from the Rental Relief Network to Hurricane Relief. Sea Coast Rentals is maintaining a list of property owners who want to participate and matching them with tenants in need. If a participating property owner would like Sea Coast Rentals to manage the property during the tenancy, the company will do so for a discounted fee, but this is not required. Property owners are free to manage the tenancy on their own. 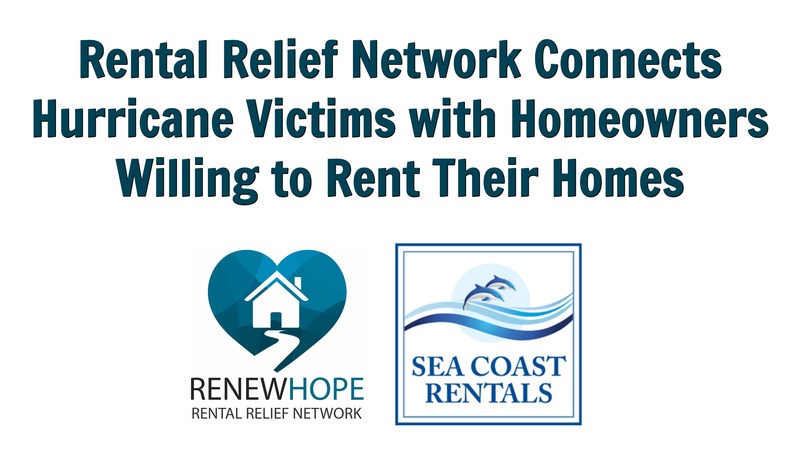 Anyone who wants to participate in the Rental Relief Network – whether a property owner or tenant – should contact Sarah Lee at 910-202-3731, via email at SarahLee@SeaCoastRentals.com or visit the Rental Relief Network Website. Established in 2003, Sea Coast Rentals is a full-service property management firm that offers weekly vacation rentals and long-term rentals in Onslow, Pender, New Hanover and Brunswick counties. For more information, go to SeaCoastRentals.com.